The unnamed, freshwater, nacreous pearl weighing 60.36 carats (241.44 grains) with an almost spherical appearance and a unique combination of yellow to pinkish-orange colors, appeared at a Christie's Contemporary Jewelry and Watches Sale, held on April 29, 2008, at the Jumeirah Emirates Towers Hotel, in Dubai, United Arab Emirates. The pearl has gone down on record as the second largest freshwater pearl and the 13th largest nacreous pearl in the world. The pearl also netted a whopping $713,000, the highest price ever paid for a natural freshwater pearl. Second largest freshwater pearl- Yellowish to pinkish orange near spherical nacreous pearl. The pearl has an apparently perfect spherical shape, but the dimensions of the pearl show that it has a longest and shortest diameter of 21.1 and 19.4 mm. By calculating the variation in diameter of the pearl, we can decide whether the pearl qualifies to be perfectly spherical, near spherical or button. A perfectly spherical or round pearl is defined as a pearl having the same diameter all round or has a variation in diameter of less than 2%, between its shortest and longest diameters. A pearl having a variation in diameter of greater than 2% and less than 20%, is known as a near-spherical or near-round pearl. A pearl that has a variation in diameter of approximately 20% is known as a button pearl. The variation in diameter of the pearl is 8%, which falls between 2% and 20% Thus this unusually large freshwater pearl is actually a near-spherical pearl. Accordingly, this freshwater pearl becomes the largest near-spherical nacreous pearl in the world, and if we disregard the Paspaley pearl which is a cultured nacreous pearl, the pearl becomes the largest spherical/near-spherical natural nacreous pearl in the world. See table below. In nature the normal tendency among large pearls is to form irregular or distorted shapes, known as baroque, as seen in the table, where the first six largest pearls are all baroque in shape. Pearl Nos. 7, 8, 10 and 11 have a fairly regular shape, and are pear-shaped drop pearls, but are not symmetrical. Pearl No 9 is the largest freshwater pearl and it is baroque. The first perfectly spherical pearl is the Paspaley Pearl, but it is cultured and not natural. The first near-spherical pearl, is the 13th largest pearl, the natural freshwater pearl, which is the subject of this webpage. The first perfectly symmetrical drop-shaped pearl, is the 14th largest pearl, the natural grey/brown pearl. Thus regular symmetrical shapes, whether spherical, near-spherical or drop shapes are extremely rare in nature. Therefore, the near-spherical shape of this freshwater pearl is an extremely rare occurrence. The weight of the freshwater pearl is given as 60.36 carats, which is equal to 60.36 x 4 = 241.44 grains. Accordingly in the table of famous single nacreous pearls above arranged in descending order of weights, 241.44 grains occupies the 13th position, and the pearl becomes the 13th largest nacreous pearl in the world. It also becomes the second largest freshwater nacreous pearl in the world, after the largest freshwater pearl, the 361.40-grain, baroque, Survival Pearl. "the combination of fine lustre, even shape and size in this pearl are noteworthy, but its colour described as 'yellow to pinkish orange' is especially unusual. In normal colour terms, orange can veer towards a red hue (thus 'pinkish') or towards a yellow hue, but the extraordinary way in which the surfaces of fine pearls refract and reflect light (orient and lustre) results here in a remarkable appearance that might best be compared with a dawn sky." According to this report the remarkable appearance of the pearl, compared to the color of the dawn sky, is due to the extraordinary way in which the surface of the pearl refract and reflect light. Refraction of light in a pearl gives rise to its "orient or iridescence" and overtone colors, and reflection gives rise to "luster." Thus, the report attributes the unique color of the pearl, to a combination of body color and overtone colors produced by refraction. However, it is difficult to say which color is the body color and which color represent overtones. If we assume, yellow and orange colors of the pearl to be its basic body colors, then pink represents an overtone color, the combination of pink and orange giving pinkish-orange. The occurrence of two body colors, together with an overtone color, is an extremely rare occurrence in pearls. The color imparted to this freshwater pearl by a combination of body color and overtones, makes this pearl, the largest colored freshwater nacreous pearl, as well as the largest colored near-spherical nacreous pearl in the world. The luster of the pearl is a reflective property of the surface layers of the pearl and like orient is dependant on the thickness of the nacre. Normally saltwater pearls have a greater luster than freshwater pearls, but the luster of this pearl is extraordinary for a freshwater pearl. The surface quality of the pearl is also exceptional, appearing smooth and free of blemishes. Why the pearl deserves to be listed among the most famous pearls of the world ? The combined qualities of exceptional size, one of the largest among freshwater pearls; an exceptional and extremely rare near-spherical shape; and an exceptional color combination of body colors, reminiscent of the color of the dawn sky, makes this enormous freshwater pearl worthy of being listed among the most famous pearls of the world, and explains the whopping $713,000 realized at the auction, unprecedented for a freshwater pearl. Freshwater pearls originate in freshwater mussels, which like saltwater oysters are also bivalve mollusks. Freshwater mussels living on the bottom of rivers, streams and lakes, have a worldwide distribution, found in all continents except the Antarctica. Out of around a 1,000 species of freshwater mussels found worldwide, around 300 species are found in North America alone, making this region the world's richest and most diverse assemblage of freshwater mussel species, anywhere on the earth. The Ohio River basin in North America, that includes rivers and streams in 13 States is the world's single largest ecosystem, that supports the largest number of species (127 species), of freshwater mussels. Other important ecosystems that supported different species of freshwater mussels were the rivers and streams of Scotland, a historically important source of freshwater pearls, that prompted Julius Caesar's invasion of Britain in 55 B.C. Freshwater mussels are commonly found in fast-flowing rivers and streams, that provide abundant supplies of oxygen, calcium and food particles such as algae, bacteria and other organic matter, conducive to their growth and reproduction. Some species of mussels have adapted themselves to living in static bodies of water, such as ponds, lakes and reservoirs. Freshwater mussels had been harvested by native Indians of America, since ancient times. 1) One of the primary uses of mussels was as a source of food, especially during the winter months when other sources of food were very scarce. 2) Discarded mussel shells were fashioned into useful tools and utensils, such as spoons, scrapers and hoes. 3) Mother-of-pearl obtained from shells were fashioned into pieces of ornamental jewelry. 4) Crushed shells were mixed with clay in pottery as tempering, to strengthen the clay. 5) Use of mussel shells as a form of currency for trading purposes. 6) Use of occasional pearls recovered from the mussels for ornamental purposes. Since the time of the ancient Indians, the first freshwater pearl discovered in the United States was in 1857, when a 93-grain pink pearl was discovered by a carpenter named Jacob Quackenbush, near Paterson City, New Jersey, in the streams of Notchbrook. The pearl that came to be known as the "Paterson Pearl" was purchased by Charles L. Tiffany for $1,500, and later sold in Paris for $2,500, to a gem dealer, who sold it to Empress Eugenie de Montijo, queen consort of Napoleon III, from whom the pearl acquired its alternative name as "Queen Pearl." The discovery of the "Paterson Pearl" in 1857, triggered a pearl mania in Paterson City, and later the entire State of New Jersey, in which all rivers, brooks and streams and other bodies of water such as ponds and lakes, were scoured for freshwater mussels and searched for the elusive pearl. Considerable quantities of freshwater pearls were discovered during this period, but soon the mussel population was totally eliminated due to overexploitation. The pearl mania, spread to other neighboring states as well, and pearls were discovered in states such as, New York, Ohio, Texas, Arkansas, Wisconsin, Mississippi, Kentucky, Illinois, Tennessee and other states. The exploitation of mussel populations in southern, eastern and central United States, left heaps of discarded shell along the banks of rivers, streams, and lakes, a by-product of the natural pearl-harvesting industry, with no apparent use. Such discarded heaps of mussel shells drew the attention of J. F. Boepple, a German immigrant to the United States, who was had been a pearl button maker while in Germany. Boepple who had been amazed by the unlimited supply of mussel shells, started the first pearl-button manufacturing plant in the United States in 1887, that made use of these discarded shells. Boepple's success in this venture was emulated by other entrepreneurs and by the turn of the century nearly 200 button manufacturing plants had been set up in the United States. The mother-of-pearl button industry, turned out to become a multimillion dollar industry, with disastrous consequences for the mussel populations due to overexploitation, but the industry survived until world war II, when shell buttons were eventually replaced by plastic buttons. This was good news for the freshwater mussel populations that were given an opportunity to regenerate and recover after prolonged overexploitation. Large scale export of freshwater mussel shells to Japan to meet the increase in demand for bead nuclei in the Akoya cultured pearl industry. In the early 1950s Japanese pearl culturists made an important discovery, that had bearing on the exploitation of freshwater mussels in the United States. They found that freshwater mussel shells from the United States provided the best material for bead-nuclei in the Akoya cultured-pearl industry. To meet the enormous demand for such material in the cultured-pearl industry of Japan, the exploitation of freshwater mussels in the United States resumed in the early fifties, leading to the formation of companies, like the Tennessee Shell Company, that became the main supplier of mussel shells to the Japanese market. The value of this industry stood at $50 million in the 1990s, and the occasional natural freshwater pearl continued to be produced as a by-product of this industry. John Latendresse, the owner of the Tennessee Shell Company, founded the American Pearl Company in 1961, in Camden, Tennessee, that pioneered the culturing of freshwater pearls in America, from freshwater mussels. During the period of his involvement in the pearl trade, since the early 1950's he initiated a collection of natural pearls, which eventually became the largest collection of natural pearls in the world. The famous 90.35-carat, snail-shaped, freshwater baroque pearl, the "Survival Pearl," the largest freshwater pearl in the world, became an important part of this collection. Freshwater pearls have a greater variety of colors than their saltwater counterparts. The mother-of-pearl, the inner surface lining of mussel shells, that produces nacre, has a variety of colors, ranging from white to shades of pink, salmon, gray and purple. Thus, any pearls produced by the mussels can assume any one of these colors. Besides these colors, other colors in which freshwater pearls are produced are :- cream, yellow, green, blue, brown, and red. However, the most sought-after colors in freshwater pearls are pink, rose, lavender and purple. Thus, yellow and pink colors found in the near-spherical, 2nd-largest freshwater pearl in the world, the subject of this webpage, are common body colors of freshwater pearls. 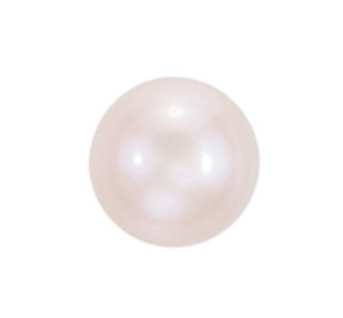 However, the pinkish-orange color of this pearl is an extreme rarity, and has not been previously reported. Likewise, the shape of freshwater pearls are more often baroque, slugs and wings. A perfectly round or near-round freshwater pearl is an extreme rarity. Hence, the near-round or near-spherical shape of this freshwater pearl is indeed an extreme rarity, that has contributed to its enhanced value. The possible source countries of the second largest freshwater pearl ? While the source country of the largest freshwater pearl in the world, the "Survival Pearl" is the United States, the source country of the second largest freshwater pearl, the 60.36-carat, near-spherical pearl that appeared suddenly at a Christie's auction in Dubai on April 29, 2008, probably from an anonymous collection, has not been identified. Nothing is known about the provenance of this pearl, and the identity of its previous owners. The pearl probably belonged to the private collection of an enthusiast, whose identity has not been revealed. In this context, identifying the possible source countries of the pearl, is only a matter of conjecture. Can the United States be a possible source country for the pearl ? Given the long tradition of harvesting freshwater pearls, dating back to the 1850s, the United States could be one of the possible sources of this extremely rare near-spherical freshwater pearl. The largest freshwater pearl, the "Survival Pearl" that was discovered in the United States, is now part of the natural pearl collection of John Latendresse. However, given the enormous size of the pearl, 60.36 carats (241.44 grains), making it the second largest freshwater pearl in the world, it is highly unlikely that such a significant discovery would go unreported, particularly in an open society such as the United States. Thus, in spite of the United States having a long tradition of harvesting natural freshwater pearls, it is highly unlikely that the pearl had its origins in this country. Other countries that have had a tradition of harvesting natural freshwater pearls are the countries of Europe. Out of these one of the most ancient sources was Scotland in the United Kingdom, where freshwater pearls had been harvested during the pre-Christian Roman period, and in 55 BC caused Julius Caesar to invade Britain, to take control of the trade in Scottish pearls, which together with gold, underpinned the Roman monetary system. Scottish pearls appeared in the pearl markets of Europe in the 12th-century, and by the 16th-century, the commercial exploitation of Scottish pearls had become a big industry in Britain. The best Scottish pearls during this period entered the royal treasury of both England and Scotland, and were eventually used in royal jewelry such as multi-strand necklaces, earrings, bracelets etc. and in pearl-studded dresses and head-dresses of the royalty of this period, as seen in the portraits of Queen Elizabeth I (1558-1603) and Mary, Queen of Scots (1542-1587). The commercial exploitation of freshwater mussels in Scotland, England and Ireland, continued into the 19th-century, but overexploitation made the fishery unsustainable, leading to rapid decline in production and closure of the industry. However, small scale exploitation by individual pearl divers and gypsies continued into well into the 20th-century, until a total ban was imposed in 1998. It was during this small scale pearl fishery, that in 1967 a professional pearl diver by the name of William Abernethy, made a significant discovery - an extremely rare, natural, freshwater, pinkish-white, perfectly spherical pearl, weighing 11 carats (44 grains) - that came to be known as the "Abernethy Pearl." Thus, another possible source of the second largest freshwater pearl is Scotland, where the fishery was based on the Unionoidae mussel species Margaritifera margaritifera, which grows to a maximum size of around 65 mm, and could accommodate a pearl of size 19.4 - 21.1 mm, the size of the second largest freshwater pearl. The freshwater Unionoidae mussel species Margaritifera margaritifera, has a natural geographic range that include the northern temperate regions of the world, extending from the Arctic and the temperate regions of western Russia, through continental Europe to the northeastern seaboard of north America. Thus apart from Scotland, freshwater pearl fisheries had existed in the past in countries like northwest Russia, Sweden and other Scandinavian countries, Bavaria, the Czech Republic, Austria, England, Wales and Ireland. Thus, apart from the United States and Scotland mentioned as possible sources of the second largest freshwater pearl, other countries that could also be possible sources of the pearl are northwest Russia, the Scandinavian countries, Germany, Austria, the Czech Republic, England, Wales and Ireland. The 60.36-carat, near-spherical, yellow to pinkish-orange, freshwater pearl was put up for sale by its anonymous owner at the Christie's Contemporary Jewelry and Watches Sale, Sale No. 7664, held on April 29, 2008, at the Jumeirah Emirates Towers Hotel, in Dubai, United Arab Emirates. A pre-sale estimate of $600,000 to $800,000 was placed on the rare pearl, which was designated as Lot No. 166. At the auctions, where there was a strong demand for jewelry pieces incorporating natural pearls, the second largest freshwater pearl was sold to an anonymous buyer for $713,000, which was within the range of the pre-sale estimate.